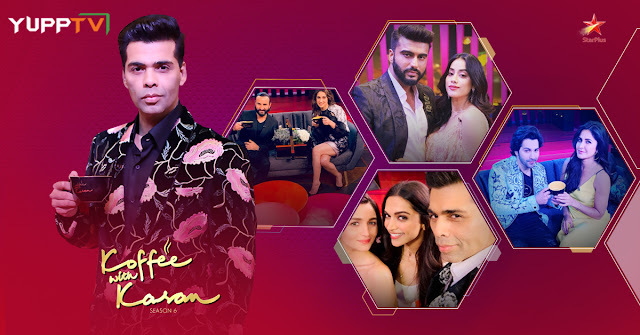 Koffee with Karan, one of the most popular, extravagant and loved shows of India Koffee with Karan, hosted by Karan Johar is coming to you on Star Plus. The Celebrity talk show that invites a Bollywood celebrity every week had completed 5 seasons till date and has recently begun the sixth on October 21st, 2018. The first episode of Koffee with Karan season 6 had featured Deepika Padukone and Alia Bhatt and the second featured Akshay Kumar and Ranveer Singh. The third episode featured Aamir Khan and the fourth episode featured Varun Dhawan and Katrina Kaif. Tune into YuppTV to Watch Koffee with Karan on Star Plus Live from Australia, New Zealand, UK, Europe, UAE, Saudi Arabia, Qatar, and other Asia Pacific regions. You can binge watch Koffee with Karan on YuppTV Catchup too. Commenced in 2004, Koffee with Karan is a Bollywood talk show hosted by Karan Johar. The show was an instant hit and became the most watched show among Indians living all over the world. The show has 3 different segments namely Rapid Fire, Opinions, and Koffee Quiz during which very entertaining professional as well as personal questions are asked. A gift hamper is presented to the participant at the end of the show. The show had won the Indian Television Academy award for being the best show in 2007. Over the years Koffee with Karan had invited most of the Bollywood actors and actresses like Shah Rukh Khan, Amitabh Bachchan, Hrithik Roshan, Rishi Kapoor, Ranbir Kapoor, Ranveer Singh, Akshay Kumar, Salman Khan, Ajay Devgan, Farhan Akhtar, Sidharth Malhotra, Varun Dhawan, Aishwarya Rai, Kajol, Sonam Kapoor Deepika Padukone, Alia Bhatt, Rani Mukherjee, Katrina Kaif, Sonakshi Sinha, Anushka Sharma, Parineeti Chopra, Preity Zinta, etc. Much reputed personnel from various sectors like Rakesh Roshan, Susanne Khan, Shabana Azmi, Vijay Mallya, Farah Khan, Rajeev Masand, Manish Malhotra, Anurag Kashyap, etc., were also a part of the show in the previous seasons. Watch it live on Star Plus Live using YuppTV Website or App. The YuppTV App can be downloaded on your Smart Televisions, Smartphones, and other internet-enabled devices.